Is The Cloud In Gamers' Future? : All Tech Considered The major game console makers have taken a time out to improve on what they've got. Some gamers don't see a need for an upgrade, others know what they'd like to see in new systems. One idea is to store games online, another to make consoles more attractive for non-gaming users. Is The Cloud In Gamers' Future? Nintendo's Wii U is the only new game system on the horizon as console makers are having a hard time figuring out how to improve on what they've got. Last year, consumers spent $17 billion on video games. That sounds like a lot, but it was nearly $1.5 billion lower than the previous year. One reason: there haven't been any new game consoles out to excite buyers. 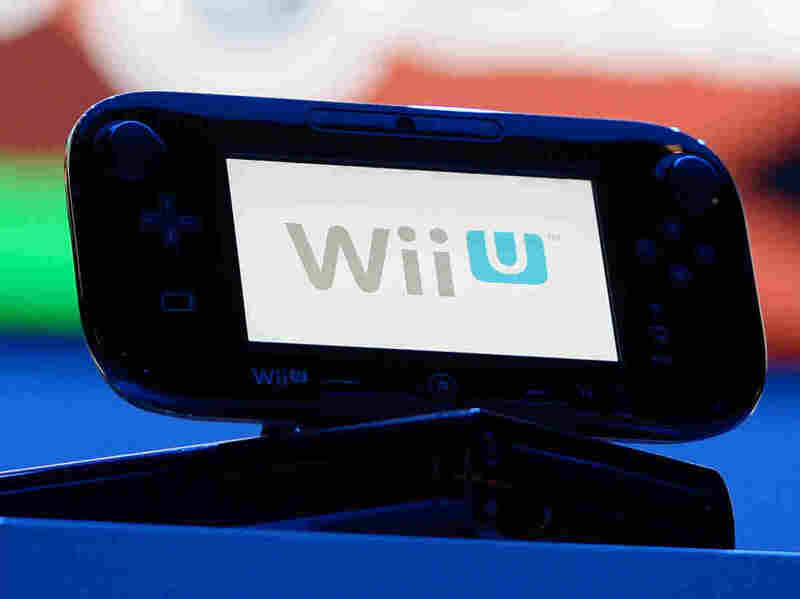 Only Nintendo's Wii U might be on shelves for the holiday season. The console makers are having a hard time figuring out how to improve on what they've got. Try asking a gamer like Ryan Block what would entice him to drop a few hundred bucks on a new console. "It's not a very satisfying answer, but I don't feel like I do need a new console," Block says. Block, 30, has been playing his whole life. And game play is at the center of his San Francisco living room. He's got an XBox 360, a PlayStation 3 and a 63-inch flat screen TV. "I would have gone larger," he says, "but this is as large as the wall is." New game consoles used to come out like clockwork about every five years. What made the new one's exciting to Block was that the graphics got better with each generation. That made the details of Block's favorite games look almost real — so say in a game like Battlefield 3 you can practically see specks of dirt on the concrete. "By any standards you look at how good some of the games look on the consoles now, and it doesn't feel like you absolutely have to upgrade them," Block says. Block's fiancee, Veronica Belmont, is also a big gamer. She, too, finds herself a bit stumped as to what would make her want to buy a new console. "That would be nice if it did the dishes and walked the dog," Belmont says. Belmont's seen pictures of the soon-to-be released Wii U from Nintendo. She's not impressed. Nintendo added a touch screen to its controller so that it can also be used to play games when the TV is turned off. "We don't need anymore peripherals in the house. I don't want to have to pay attention to another tablet device. I don't want to have to pay attention to making sure something is charged," says Belmont says. Some gamers do know what they'd like to see in new consoles. Nicolas Butler, 19, has seen write ups about goggles that would immerse him in a game. "It would basically be like you have the display here and it looks like no matter how you turn it would feel like you are actually turning in the game. Going towards that is probably where I'd like to see gaming," says Butler. Butler's friend Ryan Loughran likes that idea and has another: Don't store games on a console — store them online. "To be able to go and play with your friends somewhere I think is really important. Having an online storage or something. That eliminates having to carry around a bunch of games and CDs," Loughran says. That future is almost here. "It's not here today, but it might be here soon," says Neil Young, a veteran game designer. Young sees the future in online services. And so does Sony, which just purchased a cloud gaming company called Gaikai, a company Young says "essentially allows you to play games that are being sort of rendered in the cloud. They live in the cloud so you don't have to have necessarily an expensive hardware box to be able to play them." Young founded mobile gaming company ngmoco, which makes games like Topple and MazeFinger for smart phones. He used to design console games for Electronic Arts, one of the largest game developers. Young doesn't think online services are going to replace consoles any time soon because they don't work as well with first person shooter games that appeal to people like Ryan Block. Block says the problem is that if the Internet service is at all slow, the enemy can see you first. "The difference between like living or dying or your team winning or losing is often times a fraction of a second," Block says. So, for now Block would rather keep the console he has. And that is part of the reason console sales were down the last two years by 12 percent, according to the research firm Wedbush. Michael Pachter, an analyst at Wedbush, thinks console makers are likely to make consoles more attractive for non-gaming as a way to entice buyers. "Microsoft is very likely — I'd say 99.9 percent likely — to turn the next XBox into a television tuner and it will tune television over the Internet," Pachter says. Pachter believes Microsoft is probably already working on deals with the cable providers. He thinks Nintendo's Wii U is going to be at a disadvantage because it still focuses mostly on games. But, for Phillip Scott, 19, all that extra entertainment stuff isn't the draw. A company like Nintendo has some great games he loves to play. "For instance, if they released an Open World Wii U Pokemon game that was kind of the same experience as the old original ones but with the new kind of enhanced graphic and portability, like I would give all my money to Nintendo," Scott says. Given that game sales have been trending down all year the folks at Nintendo might want to listen to what Scott and other gamers have to say.